Below are common attributes associated to Tuscarora Crape Myrtle. Become a care taker for Tuscarora Crape Myrtle! Below are member comments regarding how to plant Tuscarora Crape Myrtle. No comments have been posted regarding how to plant Tuscarora Crape Myrtle. Be the first! Do you know how to plant Tuscarora Crape Myrtle? Below are member comments regarding how to prune Tuscarora Crape Myrtle. No comments have been posted regarding how to prune Tuscarora Crape Myrtle. Be the first! Do you know how to prune Tuscarora Crape Myrtle? Below are member comments regarding how to fertilize Tuscarora Crape Myrtle. No comments have been posted regarding how to fertilize Tuscarora Crape Myrtle. Be the first! Do you know how to fertlize and water Tuscarora Crape Myrtle? Below are member comments regarding how to deal with Tuscarora Crape Myrtle's pests and problems. No comments have been posted regarding how to deal with Tuscarora Crape Myrtle's pests and problems. Be the first! Do you know how to deal with pests and problems with Tuscarora Crape Myrtle? Looking for Tuscarora Crape Myrtle? Get Tuscarora Crape Myrtle fresh and large directly from the grower to your garden! Buy Tuscarora Crape Myrtle online from the nursery wholesalers and save BIG! Crape myrtles do not require pruning however, if you want a tree instead of a shrub, some pruning will be required to ensure a nice, full canopy, and to remove stray branches or suckers that might grow from the base. Tuscarora Crape Myrtle grows in a wide range of soil types but prefers a well-drained site. For best performance, plant in full to mostly sun. Some shade will be tolerated, but flowering will likely be reduced. As one of the taller growing crape myrtle, reaching 15 to 20 feet in height, Tuscarora is most attractive and useful when grown as a mid-size tree. It can be planted as a single specimen or in groupings anywhere in the sunny landscape and is also useful on the corners to frame a home, building and other structure. To plant a crape myrtle, dig a hole no deeper than the root ball and two to three times the width of the root ball and fill it with water. If the hole drains within a few hours, you have good drainage. If the water is still standing 12 hours later, improve the drainage in your bed, perhaps by establishing a raised bed or mound. Turn and break up the soil removed from the planting hole. If the native soil is dense, compacted or heavy clay mix in a good organic compost or soil amendment at a 30/70 ratio with the soil removed from the hole. Remove your plant from its container and carefully but firmly loosen the roots around the exterior of the root ball. Set the plant into the hole you've prepared, making sure the top of the root ball is slightly above the soil level to allow for settling. Pull your backfill soil mixture around the root ball in the hole, tamping as you go to remove air pockets. Then water thoroughly and cover with a one to two-inch layer of mulch. Crape Myrtle aren't heavy feeders. I usually fertilize them one time a year with a slow-release, well-balanced shrub & tree type fertilizer after new growth has emerged in spring. Quick release fertilizers aren't good for crape myrtle because they promote long and weaker stems that might droop too much from the weight of the large flower clusters. 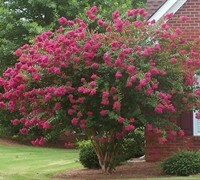 Crape Myrtle are very tough plants that have few serious insect, pest or disease problems. Tuscarora is a Fauriei Hybrid that has demonstrated excellent resistance to powdery mildew, which is a quite common problem on older varieties. Japanese beetles may visit crape myrtle during summer but do very little if any damage to the tree. Honeydew aphids might visit crape myrtles in late summer or early fall. These small green critters hand out on the back side of leaves during the day and venture to the top side of leaves at night, where they leave a sticky residue that turns black. I usually don't spray for these aphids unless it's a serious infestation because they cause little if any long term damage.